The British Gazette » A second referendum: Bah, Humbug! With six days to go until the start of Advent on Sunday 2nd December, we are approaching the Season of Goodwill towards all men (and women). The phrase, “Bah, Humbug!” from Charles Dickens’s “A Christmas Carol” is, in the English speaking world, linked to this. The conventional wisdom is that referendums/plebiscites are binary choices between alternatives, e.g. ; In/Out; Yes/No; Leave/Remain. This does NOT mean however that a referendum/plebiscite cannot be organised to deal with three choices. IT CAN. The voting method for this is the Alternative Vote. British Gazette readers will or course recall that the British People REJECTED AV (for the House of Commons) in the referendum of 5th May 2011. By 13,013,123 (No) to 6,152,607 (Yes) or 67.90% to 32.10%. In other words, by over two thirds. This rejection however was to choose their MPs. Nevertheless, the opponents of a second referendum would inevitably draw this to everybody’s attention! But let us cut to the chase: The reason why the Remainers and Remainiacs want a second referendum is because they think they will WIN! And the reason why Leavers do not want a second referendum is because they think they will LOOSE! I can understand this resistance. You see, there are Kippers who have campaigned against the UK’s membership of what was the European Community since before it joined in 1973. All that time they have been in a minority voice and since the formation by Alan Sked of the Anti Federalist League which became UKIP in the 1990s have persisted with lost deposit after lost deposit and being ignored by the media and being treated as an irrelevance. Now, they are on the verge of achieving what they have campaigned for for decades! They do NOT want it to escape from their grasp! #2: It achieves everything they have campaigned for for decades! In his authoritative and detailed blog-post today (http://eureferendum.com/blogview.aspx?blogno=87067), the excellent Doctor North has outlined the options. Based on reality and not false and ignorant perceptions of same! What is absolutely clear is this: Madame is in a NO WIN situation. Notwithstanding their general ignorance and incompetence, Tory MP’s are not so stupid that they cannot recognise a poison chalice when they see one! And Madame’s infamous deal is just that! Another political reality is this: Turkeys generally do NOT vote for an early Christmas! The average Tory back bench MP will realise that Madame’s infamous deal can be described as Purgatory and there is a General Election to be fought and won, the next general election in the United Kingdom being scheduled to be held on Thursday 5th May 2022 under the Fixed-term Parliaments Act 2011. Should the infamous “backstop” be in operation the average Tory backbencher has enough of the “little grey cells” (as another literary character Hercule Poirot referred to it) between his/her ears to realise that a Tory victory in these circumstances is about as likely as comrades Corbyn and McDonnell joining the Tory party! The problem with a Deal/No Deal/No Brexit referendum as compared to a binary Deal/No Brexit referendum is that the markets will discount the prospect of a No Deal (hard Brexit) and Sterling and the FTSE would suffer as a consequence. 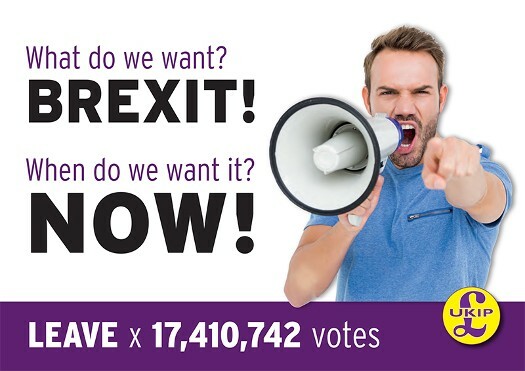 However the key factor with a Deal/No Deal/No Brexit referendum as compared to a binary Deal/No Brexit referendum is that the option favoured by UKIP is on the ballot paper. - be able to vote regardless of academic qualifications, ethnicity, faith, gender, property ownership or other Jim Crow restrictions. - be able to cast their votes without fear of intimidation or threat from the authorities. - that the ballots are not rigged. And importantly, candidates and options are NOT excluded. The image at the top of this article is of a UKIP leaflet which UKIP are hoping it’s members (not this one!) will order and push through thousands of letterboxes. That the leaflet’s message is insane, is irrelevant! The FACT is this: the UK’s former Prime Minister, The Chameleon, gave the British People the EU Referendum because of UKIP’s electoral success in the European Elections and its unswerving campaigning for what is now known as “Brexit.” It is also a FACT that it was UKIP that provided the foot soldiers during the campaign! The FACT is that the political party responsible for bringing the referendum about and the political party that won the referendum was and is UKIP. Another FACT is that UKIP has been absolutely clear as to what type of Brexit they want! Therefore, it can be argued that the most democratic course of action now is a three choice referendum of Deal/No Deal/No Brexit using AV. The British Gazette expects the ECJ (European Committee of Juggling [the wishes of member states with those of the European Union) to rule on Article 50 shortly. One must await it’s decision.